Here's a camera phone pic of the delicious chicken and waffles I ate today during Sunday brunch at Soul Gastrolounge in Plaza Midwood. It was a great after-Easter-church-service meal, plus we ate on the balcony, enjoying the spring weather. 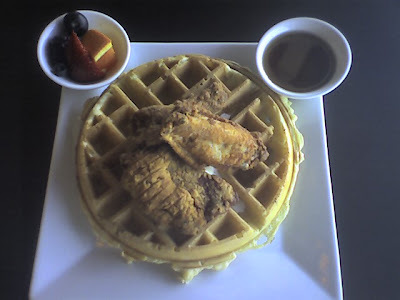 The chicken and waffles is part of their regular brunch menu, which is served Saturdays and Sundays 11 a.m. to 3 p.m., and they also had special items like Rabbit Pot Pie in honor of the holiday.